Foshan Hanchao Performing Equipment Co., Ltd. The medium duty trusses have 400 x 400mm, 450 x 450mm, and 400x500mm. The heavy duty trusses have the sizes of 500 x 600mm, 520 x 760mm, and 600x760 mm. The main tube is made of &Phi;50mm,3mm thickness the brace tube is made of &Phi;25mm. 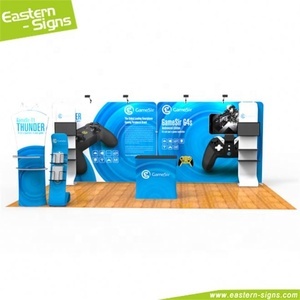 Shenzhen Nine Trust Technology Co., Ltd.
To attened 2009 Canton fair ,We helped them designed truss booth. Details you care about: Loading capacity of truss:20T Seam between trusses fit totally well. Most of our products have in stocked now,we can send them for you anytime. Guangzhou Jianwang Performance Equipments Co., Ltd.
Our products are easy to set up & disassembly and give our customers great varietyof possible installations. The trussing systems are used in entertainment, music and corporate events industries as well as by architects and designers. you can be confident you're doing business with a reputable company that is here for you before, during and after your purchase. Guangzhou Kaiyue Performance Equipment Co., Ltd.
Guangzhou Kai Yue Performance Equipments Co.,Ltd . 1.Truss Material: Aluminum Alloy 6082-T6 Main Tube Vice Tube Brace Tube 50x3mm 50x2/32x2mm 25x2mm 2.Truss Shape: Ladder, Triangle, Square, Curve, Circle and Folding Truss 3. Truss Length: 0.5-4m available, OEM offer. our team on exhibition: Welcome to contact us now ! 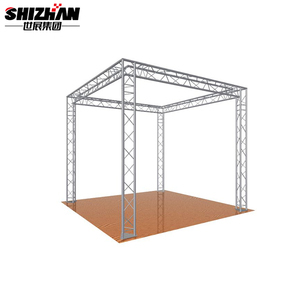 Shenzhen TourGo Event Solution Co., Ltd.
Guangzhou Xingyuan Performance Equipment Co., Ltd.
Guangzhou Juchen Stage Equipment Co., Ltd.
Guangzhou Xingyue Performance Equipment Co., Ltd.
Guangzhou Ben Jie Stage Equipment Co., Ltd.
Guangzhou Pin Yuan Performance Equipment Manufacturing Co., Ltd.
Guangzhou Longze Stage Truss Equipment Co., Ltd.
Shanghai tongjie covers an area of 8000 square meters and has more than 260 professional employees, 40% of them has over 5 years' experience. Kunshan tongjie has more than 200 employees which covers an area of 26000 square meters. Shanghai Guojie has more than 100 employees which covers an area of 4000 square meters. 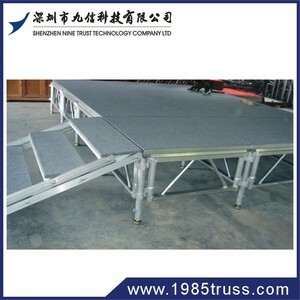 Guangzhou Pinxiang Truss & Stage Equipment Co., Ltd. 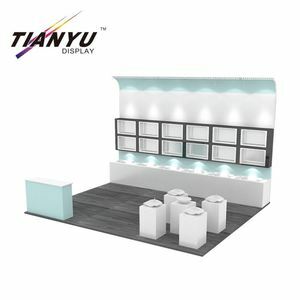 Factory Price Aluminum Stage Truss for Booth Exhibition Parameters: Product Features: 1) Easy to install and assemble. 4) Durable Structure - excellent geometry between main tubes and diagonal brace tubes. 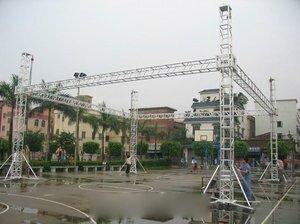 Unique Truss is a safe, stable and easy to use Truss system which is the reasonable choice for the perfect event and party, as it is the most fashion and versatile system on the market today. 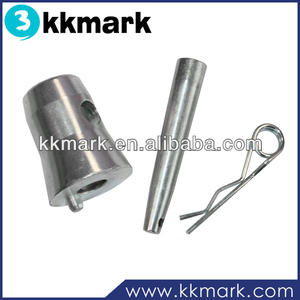 Shenzhen Poineer Performance Equipment Co., Ltd.
Guangzhou Kenzo Performance Equipment Co.,Ltd. Alibaba.com offers 10,431 performance exhibition products. 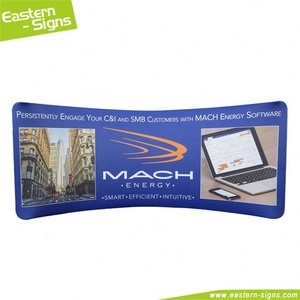 About 4% of these are other trade show equipment, 1% are display racks. 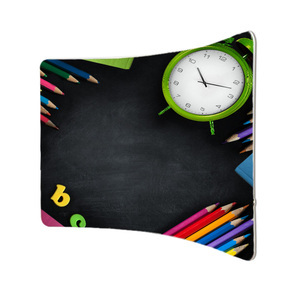 A wide variety of performance exhibition options are available to you, such as acrylic, metal, and 100% polyester. You can also choose from tft, tent. As well as from free samples, paid samples. There are 10,552 performance exhibition suppliers, mainly located in Asia. The top supplying countries are China (Mainland), Singapore, and Taiwan, which supply 93%, 6%, and 1% of performance exhibition respectively. 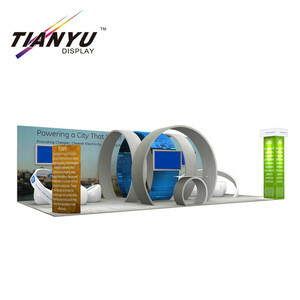 Performance exhibition products are most popular in North America, Northern Europe, and Domestic Market. You can ensure product safety by selecting from certified suppliers, including 1,399 with Other, 314 with ISO9001, and 20 with ISO14001 certification.